I recently went to the Big Island (the Island of Hawaii) with a friend for a girls’ trip. We went to Kona, Hilo, and Hawaii Volcanoes National Park. I plan to blog about a lot of things that we did. But today I want to tell you about the very first thing we did during our trip. We went to Greenwell Farms in Kona. I always say that one thing you must do while you are in Hawaii is to try Kona coffee. This incredible coffee is only grown in Kona. Since we flew into Kona, I knew that we had to go straight to the source. We went straight from the airport to Greenwell Farms because we were in dire need of some coffee after our 7:00 am flight! 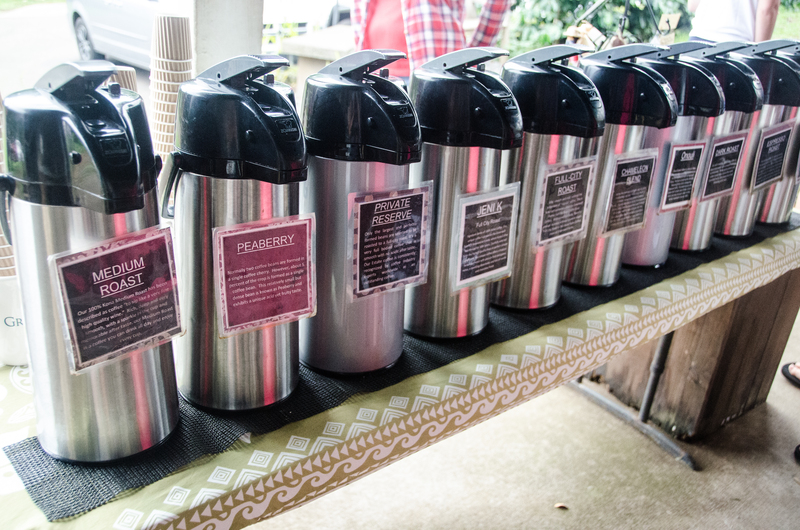 There are so many coffee farms in Kona, and, honestly, it was hard to choose which one to go to. After doing a lot of research, we choose Greenwell Farms for a few reasons. We had heard that their coffee is excellent. But, you can only get it at their farm or on their website. Bigger Kona coffee farms sell their coffee on Oahu, where I live, so I figured I could try those anytime I want. I was also interested in the history of Greenwell Farms. Henry Greenwell brought Kona coffee into the European market in the 1870’s. Greenwell Farms is at a prime location, at an elevation of 1,500 feet. It is adjacent to the ancestral home of Henry and Elizabeth Greenwell, where The Kona Historical Museum is today. I just wrote about the Kona Historical Museum’s exhibit: “The Kona Coffee Story: Along the Hawaii Belt Road”. Finally, we also chose to visit Greenwell Farms because it is still a family-run business. I love supporting local, family-run businesses. Over 150 years after Henry Greenwell began Greenwell Farms, the Greenwell family still owns and operates the farm, with today’s fourth-generation farmers Tom and Jennifer Greenwell. As soon as we parked, a tour was starting. One of the guides came over to welcome us and ask if we wanted to join the free tour or if we wanted to wait for the next tour. We immediately hopped on the tou. Our tour guide gave us an umbrella since it was a rainy morning. Our tour guide gave us a lot of information about how Greenwell Farms grows their coffee and it was all so fascinating! We learned that they hand pick every single bean! They also roast coffee beans for different farms in Kona since they have the equipment to do so. We saw coffee cherries hat were not ready to be picked yet, and I was so surprised to see that they are green. We saw the coffee trees and many of the other fruits that grow on the farm. Our tour guide bought us to their tasting area where all of their different kinds of coffee were available for tasting – even their special reserves. We were encouraged to try as much coffee as wee wanted and to stay as long as we liked. They also had four different kinds of my favorite brand of honey – Big Island Bees – available for tasting. Our tour guide told us we should at least try four different kinds of coffee to see what we like best and to get a variety: Private Reserve, Peaberry, Jeni K, and Onouli. I was especially interested in trying Onouli, which is made from 100-year-old coffee trees. The coffee from these trees is extra special because the older a coffee tree gets, the more flavorful its coffee is. But there is a catch – the tree produces fewer coffee berries. I felt so lucky to be able to try coffee from a 100-year-old tree! Of course, we bought a few bags to bring home. No reservations are required, and all of the tours are free. Our tour guide told us that the fall is the best time to visit because that is when the most activity is happening. While some coffee farms are closed for tours on the weekends, Greenwell Farms is only closed three days per year: Thanksgiving, Christmas, and New Year’s Day. Tours run continuously all day, so feel free to stop in any time. Recently, Greenwell Farms added picnic tables where guests are welcome to sit and enjoy the beautiful grounds. Bring a picnic lunch or a snack, have a cup of coffee, and enjoy this beautiful region in Hawaii. National Historical Park, the City of Refuge and a local Kona coffee farm, where you will receive a behind the scenes tour and coffee tasting. After that, you will go to the oldest macadamia nut/coffee factory co-op in the United States, where you’ll enjoy free samples of gourmet coffee, macadamia nuts, and chocolate candies. You will continue at the Captain Cook monument at Kealakekua Bay, where Captain James Cook first landed on the island. You will end the day with an optional snorkeling excursion at one of the island’s best spots. Call us today to reserve your seat!